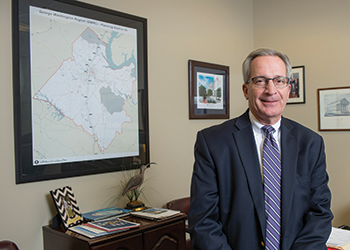 Curry Roberts, president of the Fredericksburg Regional Alliance. The Fredericksburg region has gotten large enough to start comparing itself to some of Virginia’s urban giants. There are more than 350,000 people in this region, which is the fastest-growing area in Virginia. Despite its growth, though, there’s one threshold the larger regions have crossed that this area has not. Northern Virginia, the Richmond area and Hampton Roads — the anchors of the state’s urban crescent — have enough local jobs that they actually import workers from outside their regions. The Fredericksburg region does the opposite: It exports more than a third of its workforce — nearly 62,000 workers — mostly to jobs in Northern Virginia and Washington, D.C., according to a new study. That’s not good news for this region’s tax base or for the thousands of workers who have to travel an hour or more to and from their jobs. But having an excess of workers is a good argument for the region’s efforts to recruit companies. And it’s making progress. “Our job is to figure out how to continue to diversify our regional economic base. And we’ve got the tools to do that,” says Curry Roberts, president of the Fredericksburg Regional Alliance. That study, released in May by the Center for Business Research at the University of Mary Washington, gives the clearest picture yet of what these 62,000 out-commuters are like. They tend to have higher levels of education and higher incomes than noncommuters. They are more likely to have military experience — 28 percent compared with 12 percent of noncommuters. And perhaps most importantly, more than half work in the six industry clusters that the region is targeting. Plus, the commuting workforce generally makes a lot more money. In the computer-science field, for example, commuters make an average of $112,600, while a noncommuter in the same field averages just under $81,000. The higher salary level for out-commuters was consistent across eight major fields of study, says Bradley Hansen, a UMW professor of economics who helped prepare the study. The likely reason the pay is higher is that commuters expect it. Among commuters with degrees in computer science, for example, 79 percent report commutes of at least one hour. That means that over a year they would average about 12.5 work weeks just in commuting. “From the standpoint of commuters, salaries need to reflect the compensation they expect to receive for their skills and experience and the compensation they expect to receive for the time and money they spend on commuting,” Hansen writes. Translation: If they don’t have to commute so far, they’ll take lower salaries. Stafford County is the northernmost locality of the region, which makes it most likely to lure companies from the Northern Virginia and Washington-area market. It doesn’t expect to compete for the corporate headquarters of major players in the defense and government contractors that dominate those markets. “We’re going for the divisional and regional offices,” says Richard Cobert, business development administrator with Stafford’s Department of Economic Development and Tourism. The county is laying the groundwork for those kinds of employers. This year it set aside $500,000 to help launch the Stafford Research and Technology Park, which is setting up shop in the Quantico Corporate Center, an office park at the county’s northern boundary near Marine Corps Base Quantico. In October, the center hired its first director and plans to lease some space at the office park. It will be an incubator for entrepreneurs, with a focus on cybersecurity. Two years ago Northern Virginia-based SummitIG laid dark fiber (fiber infrastructure not currently being used) along the Interstate 95 corridor, which borders the corporate center, and this summer Yyotta LLC set up an exchange point and a data center there. It’s a big step for the region because without that infrastructure in place, companies needing that kind of connectivity would just look elsewhere. “It’s a great opportunity for the next phase of growth,” Cobert says. The current phase of growth in the region is more about new housing and transportation. A 2.2-mile extension of the Interstate 95 Express Lanes is under construction and should be completed in 2018. It will bring the southernmost point of the lanes deeper into Stafford. And next summer an even bigger change is coming when construction starts on a new $150 million interchange on I-95 right in the heart of Stafford. Given that I-95 is pretty much the reason this region has grown so quickly, a project like this will have a big effect. The new interchange will be just south of an existing exit, which is a miserable two-lane traffic choke point leading to the county’s government center buildings on U.S. 1. A new four-lane road from the interchange will lead directly to Stafford Hospital, which opened on U.S. 1 in 2009. On the west side of I-95, the interchange will give new access to hundreds of acres of undeveloped land. The new interchange — expected to be completed in 2020 — also will make it easier to reach Embrey Mill, a new 831-acre development just west of I-95 that, at build-out, could have up to 1,800 homes. That kind of housing project, driven by access to I-95, is a continuation of the pattern that helped make Stafford, at more than 142,000 people, the region’s biggest county. Spotsylvania is second at roughly 130,000 people and it has the same kind of interstate-access development. Last year, for example, Spotsylvania leaders approved a 241-acre residential project called Jackson Village, near the U.S. 1 interchange on I-95. It hasn’t broken ground yet, but the rezoning will allow for 2,270 homes. Not all the economic expansion is driven by proximity to Northern Virginia, though. The region’s mid-Atlantic location and interstate access has helped bring a couple of big employers recently — projects that have nothing to do with proximity to Northern Virginia. In Spotsylvania the Germany-based retail chain Lidl broke ground a year ago on a $125 million distribution center. That facility is expected to create 200 jobs. Even farther south, North Carolina-based grocery chain Harris Teeter announced plans in late 2015 to build a new distribution center on 190 acres in Caroline County. The facility will eventually be 1.5 million square feet, and the company says it will employ about 400 people. The project hasn’t broken ground yet, but Harris Teeter already bought the property, says Gary Wilson, Caroline’s economic development director. It’s worth noting that this Harris Teeter project is about 40 miles south of Stafford’s new technology park. Caroline, with just under 30,000 residents, is less than a quarter the size of its northern neighbors, so there’s much less commercial activity. Plus, says Wilson, “We don’t have federal investment here.” The other big project coming soon to Caroline is a new Walmart superstore, which will likely break ground in 2018 and bring another 500 jobs. The county also is getting a major road expansion, a $26 million project paid for with state and local funds at its state Route 639 interchange with I-95. “It’s a really good project for us, because it completely opens up this corridor to commercial access,” Wilson says. That seems to be key to attracting the bigger private-sector deals in this region — have a growing population or a few exits off of I-95, or preferably both. The region’s King George County, to the east, has neither of those things, but it has a healthy local economy with a September unemployment rate of 4 percent, which is in line with its neighbors. The county’s biggest asset is the Naval Surface Warfare Center, on the Potomac River. It has 4,850 civilian employees, according to county figures, with a $499 million annual civilian payroll. It also has 1,807 contractors supporting the facility. King George is the region’s smallest locality in population, at 25,500, smaller even than the city of Fredericksburg, which has about 28,000 people. The city’s downtown is in the midst of a makeover, with several new upscale townhome and condo projects planned or already completed. Its restaurant sector is thriving, too — the city’s annual meals tax receipts are up $1.1 million this year compared with 2013. The city’s downtown is unique in the region and is a destination for locals and visitors. But, much of the region’s economy is still driven by the Washington economy. You could reasonably say its gravity reaches to the southernmost station of the Virginia Railway Express, which opened a year ago. On weekdays the earliest northbound train leaves at 4:57 a.m., and even those passengers have to drive to catch the train because there is no housing near the station, just woods. That’s been the formula here for a few decades. If you’re willing to commute a long way, you can buy a house for way less. But, Roberts with the regional alliance says that commuter ethic might be retired with the baby boomers. By 2025, he says, about 75 percent of the nation’s workforce will be millennials.